SACRAMENTO, Calif. (AP) On a night when Dirk Nowitzki inched closer to another NBA milestone, his Dallas teammates also took a collective step forward in what has been a mostly disappointing season. Baby steps, for certain, but a definite move in the right direction for a team that went into the game with the worst record in the West. 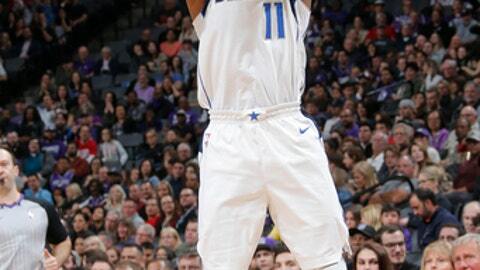 Yogi Ferrell made consecutive 3-pointers to spark a big run at the start of the fourth quarter and the Mavericks beat the Sacramento Kings 106-99 on Saturday night to snap a five-game losing streak. Nowitzki had 15 points and seven rebounds, Harrison Barnes scored 18 points and Dwight Powell added 17 points and nine rebounds to help Dallas win in Sacramento for the first time in nearly three years. Nowitzki played 26 minutes and needs six more to become sixth player in NBA history to reach 50,000 for his career, joining a list that includes Kareem Abdul-Jabbar, Karl Malone, Kevin Garnett, Jason Kidd and Elvin Hayes. The Mavericks trailed by as much as 10 in the second half and were down 85-81 heading into the fourth before opening the final period on a 16-0 run. Devin Harris followed Ferrell’s back-to-back 3s with a pair of layups, including one off a midcourt steal. After Nowitzki connected from deep, Harris made a 3-pointer to put Dallas up 97-85. Sacramento closed to 100-94 on a free throw by De’Aaron Fox with 2:45 remaining but Barnes made a driving one-handed dunk and a more traditional two-handed jam to help the Mavericks hold on. Dallas won for the second time in 10 games. Fox and Temple had 15 points apiece for Sacramento. The Kings had not lost at home to the Mavericks since Feb. 5, 2015. Barnes and Nowitzki combined for the Mavericks’ first 17 points of the game while making five 3-pointers, all of them uncontested. Dallas got a lift from Powell early in the second and Barnes added a fourth 3, but Buddy Hield hit a 13-foot runner to beat the shot clock buzzer with 6.9 seconds left and pull the Kings within 56-54 at halftime. Mavericks: Barnes’ first 12 points came on 3-pointers. . Dallas is 13-10 when holding opponents under 100 points. . Powell had three dunks in the third quarter, including on back-to-back possessions. Kings: Sacramento missed its first 10 shots in the fourth quarter. … Kosta Koufos started the third quarter in place of Randolph. Koufos finished with eight points and seven rebounds. … Jason Williams, who was a wildly popular player in Sacramento from 1998-2001, sat courtside next to owner Vivek Ranadive. Mavericks: Play at the Los Angeles Clippers on Monday. Kings: Host the Chicago Bulls on Monday night.